902 - Brown havana frame and G15 lenses. 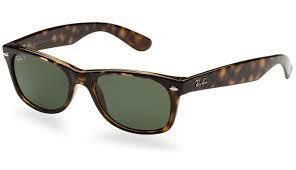 The Ray-Ban RB 2132 is called the 'New Wayfarer' as it is a softer shape than the original Wayfarer, and easier to wear. The sunglasses have the Ray-Ban logo on the right upper temporal lens and features on the temporal part of the arm. The Ray-Ban RB 2132 sunglasses come with their own branded case, cloth and packaging, and all sunglasses are covered by the 12 month no quibble Sendoptics guarantee.